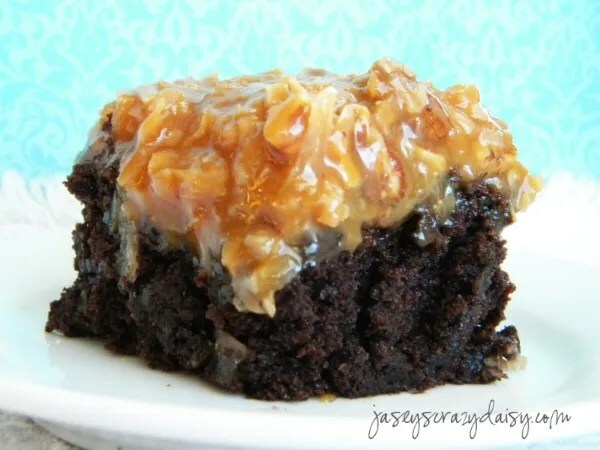 Sometimes you need a fabulous dessert but don’t know where to begin – trust me, start here with these German Chocolate Brownies. I totally get it, I’ve been there when I didn’t have the time to put together my favorite homemade recipe and I really didn’t want to have to fake it and buy something from my local bakery only to hurry home, throw away any and all discriminating evidence (aka the package), and serve it on my favorite platter. We’ve all been there. That’s when I love recipes like this – fabulous shortcut recipes. I know some of you are going to walk away from this recipe as soon as you see that the brownies start with a mix. Don’t. I’ve never met a brownie, homemade or other, that I like more than these brownies. They are moist and fudgy and delicious and frankly I am tired of searching for a homemade brownie that’s better. If you are totally against brownies from a mix, just sub in your favorite recipe and all will be well. Let’s just agree to disagree on this one, ok? Now for the frosting – it seriously doesn’t get any easier or more delicious than this and with only 3 ingredients!!! No one will ever guess that it’s cheater frosting! They will only ask for another slice, to marry you (true story), or for the recipe (in which case I totally don’t blame you if you want to say that it’s your grandma’s secret recipe and not fess up because we all need our secrets, although I would love it if you sent them over to check the blog out ;).) 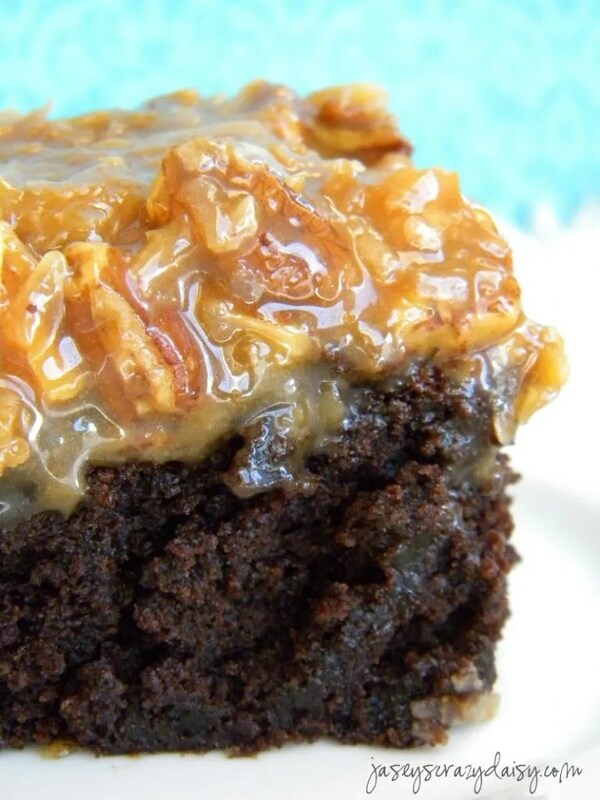 We’ve got amazing brownies and fabulous frosting and they come together to make one of the best German Chocolate Cake treats out there. There is just something about the two of them that were meant to be. My non German Chocolate Cake fans even love these chocolate brownies. In fact, you will probably make them all the time and not just when you need something easy. They are just that good. As a matter of fact, I think I’ll have another. Prepare brownie batter according to package directions (use both mixes in the same pan, doubling all ingredients called for on box), adding 1/3 cup hot fudge ice cream topping, unheated and straight from the jar. Make sure to follow the high altitude directions if you live at high altitude, see my notes above. Bake as directed, until a toothpick comes out nearly clean with only a few crumbs remaining. Cool. Sometimes I place them in the fridge to help them chill so they are set and hold up to spreading the frosting better. While brownies are cooling, scoop caramel topping into a heavy bottomed saucepan and heat over low until caramel is soft and easy to stir. Add coconut and pecans stirring gently until evenly mixed. If brownies are not quite set when your frosting is ready, keep it warm, stirring occasionally. Keeping the coconut caramel mixture warm will help it to spread evenly without tearing brownies apart. When spreading the frosting over the cooled brownies it can be helpful to drop spoonfuls of the frosting mixture evenly all over the top surface of the brownies. Then use the back of a spoon or a knife to spread the frosting to fill in the gaps between and to the edge of the brownies. Enjoy! I live at a high altitude and always follow the high altitude directions using 5 eggs and 4 tablespoons of extra flour with the brownie mixes. I double the oil and water amounts as directed on the package. Are u using a 9×13 pan size for your brownies? Do you toast the nuts before u use them for your frosting? Maria, yes, you will want to use a 9×13 pan, 🙂 I usually don’t toast the nuts for this recipe, but you could totally toast yours if you want to. I think they’d be great either way! These are one of my very favorite treats! Enjoy!